Just like last Saturday, today I took the hour and a half bus into Seoul (which only costs around 2,000 W which is < $2.00) for the (nearly) free Korean class at Sookmyung Women's University. It's a pretty nice-looking campus. Here's a peek at complex vowels if you want an idea of what I'm learning. After class we walked around to look for some dinner. We decided to try to order some kimbap (what I liked when the sister, mother, and I went to that Korean restaurant in Madison this summer). 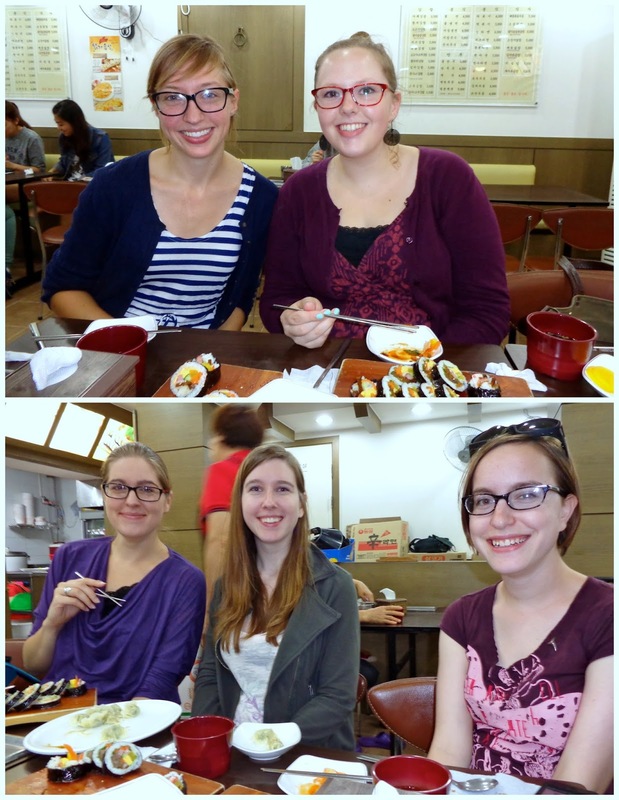 I'm glad we went and did it together, as eating in a Korean restaurant by yourself the first time can be intimidating when you only speak four words of Korean. But look at what we ordered! The five of us couldn't even finish it all, we had so much good food. And guess how much we each paid for this feast? Actually, I think that will be my contest for the week. I made three purchases today: an umbrella in the metro, one tube of Burt's Bees regular chapstick, and finally dinner (my portion). Ok, now try to match up the prices with the items! 3, 2, 1 go! Thanks for guessing -- but incorrect. I'm adding Andy's guess here for him: "Heres's my guess: Umbrella 8000, Burt's Bees 5600, and dinner 3500. (Line says Burt's Bees 8000, Umbrella 5600 and dinner 3500)"
Line is the only one who got it right! Congratulations! Thanks for playing! Sorry, not a winner. You got the dinner right, otherwise no go. Sorry, not a winner. Thanks for guessing!